Turkish striker who has become one of the biggest names in Super Lig as a member of clubs like Trabzonspor and Galatasaray SK. He led the league in scoring in three straight seasons from 2011 to 2013 and was named Super Lig Player of the Year in 2013. He began playing for Antalyaspor's youth squad in 1994 and made his senior debut with the club in 2002. 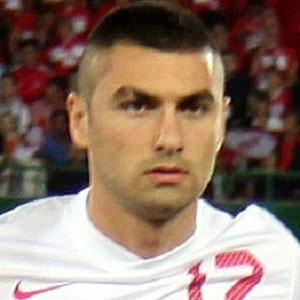 He became the first player in history to score a goal in five consecutive matches as a member of the Turkish national team. He married Istem Atilla in 2014. He has a sister named Manolya. He has been teammates with Selcuk Inan at Galatasaray SK.